For the second time this year, I went to bed quietly expecting a national vote to go one way only to wake up the next morning and discover it went the opposite way to what I hoped for. Although I'm shocked and disappointed by Donald Trump's election victory it doesn't compare to how upset I felt after the Brexit result. I understand and recognise that many of the same forces that led to Brexit are behind Donald Trump's election win. My main feelings over the last couple of days have been one of general uncertainty. What does the future hold for America and the world with Donald Trump as President? It's this uncertainty that I find uncomfortable to deal with. I've written about this before in earlier blogs and what's clear is that there is a growing movement and revolt against establishment politicians and global elites. Donald Trump becoming President is the biggest reaction against this. We constantly hear about those people who feel left behind by the effects of globalisation, the disappearance of well paying manufacturing jobs in places like the American Mid-West and the North of England. People who feel the elites and establishments in London, and the East and West Coasts of the US don't understand or are interested in their lives. Many people quite rightly feel that the system is no longer working for them anymore. I get this I just don't believe that Trump will have the answers to many of the problems and frustrations many people feel. I know I'm not the only person who assumed his leadership bid would simply run out of steam, that it was a bad joke that wound eventually stop being funny but it's no longer a joke, Donald Trump will be the next President. In terms of him implementing many of his policies, I'm convinced that when faced with the day to day realities of government some of his policy statements will either be abandoned or severely limited. The Wall along the Mexican border - surely that cannot happen? I might be overly optimistic in saying I don't think Trump's Presidency will be quite the nightmare that many of us think it will be but at the same time it's not going to be great. His election victory says a number of things about how America sees itself, both at home and abroad but also how we in the West choose to deal with many of the social and political challenges that lie ahead. The outcome of Brexit and the US Presidential election tell me that the forces of reactionary right wing populism are on the rise. That in dealing with our challenges means that we become a nations more insular, fearful or hostile to others. That we're happy not to try and change the system to make things better but instead we'll smash the system up completely regardless of the consequences. I feel deeply uncomfortable with the way things are going? What worries me is that Brexit and President elect Trump is simply the start of a domino process. We have elections coming up in the next 18 months in France, Germany and Italy. Are we going to see a similar anti establishment backlash in those countries? Certainly in France the political climate appears ripe for Marie Le Pen's National Front to make major gains. I feel that in historical terms we're coming to the end of an era in history. Since the end of the Second World War. We've seen countries come to together both economically, politically and militarily to ensure future peace and prosperity. The problem is that this consensus of free trade, the movement of goods people and capital around the world. Political and economic unions like NATO and the EU are in danger of breaking up as a result of these anti establishment forces. After reading and listening to all the analyse on Donald Trump, part of me feels it can't be as bad as we think it's going to be but what I am concerned about is the future of international relations and the prevailing thoughts and values that are emerging. Eight years ago Barack Obama was elected the first African American President. Rarely have I felt so much optimism, even though expectations on Obama were ridiculously high. After this week's Trump victory never have I felt so much pessimism. This week's ruling on Article 50 by the High Court seemed to be a moment of sanity that us Remain voters had been crying out for since the Brexit result. The decision by the three senior judges means that the Prime Minister, Theresa May cannot trigger Article 50 without approval from parliament. This would seem a perfectly sensible and reasonable thing to do, before we go ahead with such a crucial decision. We should at least have some idea of the kind of Brexit we're going to get as a country and it's only right that Parliament has a say on such a significant matter. This however is not the thoughts of your Brexit fundamentalists and the right-wing press. This week's decision for them was a case of unelected, out of touch judges blocking the will of the British people. The reaction of the Daily Mail and The Express was ridiculous as they descended into a collective melt down. Not only was it totally predictable but I couldn't help but quietly laugh to myself. Brexit was never going to be an easy straight forward affair and so it's proving. First things first, the UK will still be leaving the EU. Even as a Remainer I accept that decision. What's now important is the kind of Brexit we're going to have. What annoys me is that Brexiteers think that because they won the referendum, those of us who voted to stay in the EU must now shut up. It's as if we're not allowed to debate or question the terms of Brexit. What seems to have been completely overlooked is the vote for Brexit was only 52%. It's a majority but not a huge majority. A significant number of people in this country did not vote to the leave the EU and those thoughts and feelings have to be taken into account. When I think about Brexit and those who most advocated the UK leaving the EU, I'm reminded of a chant commonly sung by football fans around the country. Fans will be familiar with moments in matches when the referee makes a series of wrong and strange decisions in a short space of time that gives the impression that he's lost control of the game, a familiar chant of: 'You don't know what you're doing' rings out from fans of the team on the wrong end of these decisions. I think about that chant in relation to Brexiteers and feel compounded to shout 'You don't know what you're doing' every time someone tells me that Remainers should shut up and that Brexit will prove to be a brilliant success. It's quite clear that within the Brexiteer vote there are different visions of what a post EU world will look like for the UK; there's no clear consensus on what Brexit will mean. Last week's High Court decision on Article 50 is about implementing the necessary checks and balances needed in this process. Applying appropriate scrutiny and ensuring that over the next 6 months we get some clarification on what the long term plan is. If this country is now going to leave the EU then I'd like to leave in a way that I think is best for Britain. If you asked people who voted for Brexit you will find a whole range of different reasons for their vote. Immigration, more money for the EU, an end to EU red tape and regulation. It's quite clear there is no clear consensus or idea on what a post Brexit world should look like for this country. Brexiteers and the right-wing press might want to remember this before they accuse Remainers of being enemies of the people. Rio Olympics: When did Team GB become a sporting giant? When I first started watching the Olympics in the 80s and early 90s If Britain won 5 Gold medals that was usually considered a success. By the time I watched my fourth Olympics in Atlanta in 96 Britain finished 36th in the medals table and only one gold medal. To see Great Britain re-invent itself as a sporting powerhouse over the last 3 Olympics still takes a little getting use to but don’t worry I’m not complaining about it, I’m loving it! At the start of this summer’s Olympics I thought realistically the best we could hope for was to finish third behind the USA and China. To beat China into second place is incredible! It's official, #GBR have finished 2⃣nd in the Medals Table! What’s been really great to see, is that we’ve continued to win medals in our strongest events like cycling, rowing and sailing but we’ve now become successful in sports like gymnastics where Max Whitlock won 2 gold medals. For most of my life I simply accepted that Britain couldn’t do gymnastics. So the question everyone is asking is how have we become world beaters? From the nadir of 1996 it’s clear that lottery funding has transformed British sport. But it’s not just the money that’s being spent it’s how it is allocated that’s been crucial. Every sport has its Olympic target in terms of medals they should be winning. Those sports that meet and exceed their targets like cycling get an increase in lottery funding, those that fail see a decrease. Success is rewarded and failure is punished. This may be harsh but after London 2012 Britain’s swimming team has their funding reduced after failing to meet their targets but this time in Rio they’ve had one of their most successful ever Olympics. What’s really changed in the last 10 – 15 years is that there has been better funding for our Olympic sports and structures have been put in place that create, nurture and sustain successful athletes. Britain has always been a sporting nation but in previous Olympics our culture seemed to be one of ‘it’s the taking part that counts’. We had too much of the old amateur ethos. We didn’t have the attitude of the old Soviet Union or today’s China who view sport as a way of showcasing national power and prestige. We occasionally won individual gold medals but that was a result of individual athletes succeeding on their own terms. Today, in sports such as cycling, our athletes succeed not only because they have the talent, ability and desire to win but because they are part of a much bigger system that generates success. This is the key difference for me. I certainly don’t miss the days of Team GB winning a handful of medals at Olympics, I always thought we underachieved, now we’re punching above our weight and it feels good. It’s inspiring to see athletes from all different backgrounds and all walks of life succeed in a variety of sports. We don’t need to win to prove a point to the rest of the world. We can win because we want to be the best that we can be and this is what I love about our Olympic athletes. It's been quite a low key start to this year's Olympics. There hasn't been the same level of buzz and excitement in the lead up to Rio's Games. I think there's a couple of reasons for this. Firstly after our own London Games in 2012 it was always going to be difficult to have the same level of excitement. Secondly, within Brazil itself the Games seem to have arrived at just the wrong time with the country mired in economic and political problems. Rio's opening ceremony costs and production were scaled back and made simpler in response to the economic situation inside the country. Just like with our London Games, the situation in Brazil has raised questions on the purpose and supposed benefits that having the Olympics can bring to a city and country. I think this debate is more pertinent in a country like Brazil when you consider the extreme levels of inequality that exist. It becomes increasingly difficult to support holding an event like the Olympics when so many of the local inhabitants are living in poverty. This got me thinking about the debate of hosting not just the Olympics but also World Cups. They are the two biggest and most prestigious sporting events in the world. But as we found with our own Olympics, when countries are asked to spend billions hosting these events on behalf of the IOC and FIFA there are legitimate questions on what the benefits will be for the host city and country in the short and long-term. 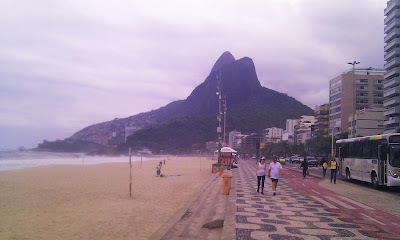 On a personal level, I visited Rio in 2013. I took a tour of the city's most famous Favela, Rochina. To say the experience was an eye opener would be an understatement. After spending my first few days in the affluent beach districts of Leblon and Ipenema, visiting Rochina (20 minutes away) was like travelling to a different country. I remember asking my tour guide whether the 2014 World Cup and Rio Olympics would really make a difference to communities like Rochina. There have been improvements and after decades of neglect, the Brazilian government has made more of an effort to address the problems of Brazil's poor. However, with the economy in Brazil now struggling, justifying the Olympics in a city like Rio is quite difficult. The IOC and FIFA are now at a point where there are only so many countries in the world that have the resources and infrastructure to hold these events. In Western democracies, governments simply can't spend billions on these events without justifying them to their electorate. The problem for the likes of the IOC are that more countries are looking at the cost of the Olympics and deciding they can do without them. For the 2018 Winter Olympics the IOC were faced with the embarrassing situation of potential host cities failing to get enough backing from their public during the bid process. Apparently the IOC had their hearts set on Oslo, Norway. They wanted a Winter Olympics back in Europe and in a country with a tradition of winter sports. Unfortunately, Norway had different ideas. Local news out-lets got hold of the IOC's outlandish demands for their elite committee members. Once this became public, the Norwegian people said thanks but no thanks and decided they didn't want the Olympic Games. In the end the 2018 Winter Olympics were awarded to China, but China isn't a democracy and the Chinese Communist Party can do what they like without having to be held accountable to the Chinese people. How many cities and countries realistically want to host the Olympic Games, have the resources and infrastructure and the backing of their own populations? I think we're getting to a point where there's a small number of countries and cities that can hold the Olympics. A thought I have is that perhaps we should look at selecting a group of cities around the world, perhaps 10 and say you will hold the Olympics over the course of the next 50 years and rotate the Olympics between these chosen cities. London would definitely be a member of that group, elsewhere in Europe you could include Paris who seem an obvious European choice but after Tokyo's turn in 2020 where does the Olympics go next? Who wants and can realistically host it? These are legitimate questions that need to be asked. As much as I love sport and the Olympics, it simply isn't appropriate to hold such lavish and vast sporting events if they do not have the backing of the host population; and if they don't provide any long term tangible benefits and for those people. The death of Prince is another legendary figure that we've lost in the world of music this year. What is it about 2016? I love Prince. He's another artist whose music defined my childhood. His records says a lot about what I'm all about in terms of my own music taste. When I was growing up, what I loved about Prince was that he was a proper pop star. He wasn't like ordinary people. There was the glamour, the otherness and of course the music. I loved 1999 which was the first Prince record I remember. I loved the video and the lyrics that spoke about partying like it was 1999. As a 7 year old I imaged we'd be flying in space ships by the time 1999 came round. As I grew up through the 80s and 90s what I admired most about Prince was that he could do everything. He could play rock, pop, soul, funk and jazz, he could do it all. His versatility was amazing. Like David Bowie I think I like artists that can tread that fine line between commercial success and artistic integrity. People that are hugely talented but always looking to push the boundaries in terms of their art. From the reports it sounds like there are hundreds of tracks recorded by Prince that were left in the vaults and never released. Prince may be gone but his music remains and I'm looking forward to hearing his old 'new' material. A friend on Facebook posted this video which highlights what an incredible guitarist Prince was. Unless you're a Nottingham Forest or Spurs fan you're probably hoping that Leicester City pull off the impossible by winning this season's Premier League. This is looking more likely following Leicester's 2-0 win today away at Sunderland which leaves them 7 points clear of Tottenham with only 6 games of the season left. If Leicester win the Premier League it will be the greatest achievement in modern English football history! There's simply no precedent for it. A team that in the space of 18 months have been transformed from relegation certainties to virtual Premier League Champions. What makes Leicester's story so remarkable is that this simply wasn't meant to happen. The advent of the Premier League followed by the growth of the Champions League meant that mid ranking provincial clubs like Leicester could never compete with the big clubs. If you want to find the nearest comparison to what Leicester are potentially about to achieve, you have to go back to the 1970s. Unfashionable Derby County won the league for the first time in 1972 under Brian Clough and again in 1975 under Dave Mackay. In 1978 Nottingham Forest (managed again by Clough) won the league in their first season after gaining promotion from the old Second Division. The difference between the 70s and now is that there wasn't as much money in the game. The traditional big city clubs couldn't dominate in the way they have done during the Premier League era. So how do you explain Leicester's success? When the Premier League was created it was partly to ensure that the big clubs could maximise revenues generated from the game. The increased revenue from TV rights allowed big clubs like Man Utd, Arsenal, Chelsea, to dominate the league consistently which is what they've done for the last 25 years. This season things have started to change. The improved television deals have now meant that mid ranking and smaller clubs now have enough money to buy top players from bigger European clubs and compete with the Premier League's traditional powers. They also are no longer under pressure to sell their better players to raise cash. In the Premier League, the likes of Stoke, Southampton, Swansea, and Watford can pay bigger salaries than genuine big European clubs such as Marseilles in France or the big clubs in Italy or Spain. There's a limit to how many players any one club can have. The very best players in the world play for Real Madrid, Barcelona and Bayern Munich. England's big clubs now face a new challenge of mid ranking clubs buying players who in previous eras would have been playing for big European clubs. It's ended up leveling the playing field which is possibly an unintended consequence of more tv money coming into the Premier League. Leicester's achievement this season is a big wake-up call for the big clubs. For too long they assumed that the so called natural order could never be disturbed. Their wealth and continued presence in the Champions League meant that they never had to think that smaller clubs could ever threaten them. What Leicester have done and other clubs like West Ham, Watford and Bournemouth have shown that money can only take you so far. Creating a winning and successful team is about recruitment, picking the right type of players, team work and tactics. Leicester's recruitment in recent years has been superb. How many clubs would have taken a chance on a player like Jamie Vardy who until a few years ago was still playing non league or Riyad Mahrez, plucked from French football obscurity! "where there is a bit more pressure perhaps on some of the bigger clubs to bring in players that are going to be hitting the ground running and top players verging on world class almost immediately"
There's nothing stopping clubs like Man Utd buying unheralded players and developing talent but there's this idea that they have to buy players at the very peak or coming close to it immediately. Why? Leicester's success proves you can pick up unheard of players and developing them into star players. The attitude of big clubs is one where they don't want to do this. One exception is Barcelona and their youth policy but look at Chelsea. Their youth teams continually win trophies but none of their young players ever seem to get the chance to progress into the first team. On a separate note, earlier this week, I was looking through some of my old Birmingham City programmes and came across the Leicester City Programme from the game I went to at Leicester in March 2012. It's amazing to see names like Wes Morgan and Danny Drinkwater in Leicester's squad. Leicester missed out on the playoffs that season but those type of players have progressed and improved and that team spirit has been vital to Leicester's success. Will Leicester be a one off? Quite possibly. Leicester may finish mid-table next season but I don't think it matters. What Leicester have done is give hope and inspiration to about 97% of clubs in the country. They are reminding us that success in football doesn't just have to be about how much you pay in transfer fees and player wages. You don't necessarily need billions to compete. Forgotten virtues like team spirit, clever recruitment, mixed in with tactics that get the best out of the players available reminds us that there's a chance for all us and that's why everyone so wants Leicester to win the league.